Get Your Holiday Party Started with Dry Ice & Luges! Based in Morris Plains, NJ. Serving New Jersey for over 35 years! Start planning for your Spring and Summer Parties. Warm Weather is Coming! Get Ready for the Season! Consider Esposito's for all your ice and party rental needs Spring! The weather is getting cooler and it's time to plan that Holiday or New Years party! Enjoy time with your friends and family with ice rental through Esposito's Ice to enhance any event. We offer ice rental for event like a Memorial Day BBQ, Birthday Party, Anniversary, or for the big Baseball game! We pride ourselves in providing you with the best ice services in the area! Order your Party Rentals and ice today! 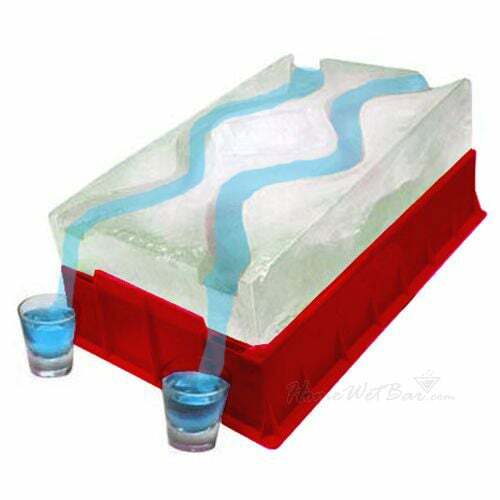 Order a Party Luge for your Next Tailgate Party! The Party Luge is perfect for tailgating at Football games, 21st Birthdays, Holiday parties and more! Esposito's Ice customers love our party luges. Carved from a single block of ice, our luges feature two channels carved on an incline and a bottle holder in the rear. Pour your drink of choice down the channels and have fun! For only $95, you can take your party to the next level! PLUS, we also offer frozen shot glasses! So don't wait any longer! Purchase your Party Luge with Esposito's Ice today! You'll be sure to have the coolest tailgating setup around! Looking To Plan A Party? Esposito's has you Covered! We offer a variety of tables, chairs, tents, coolers, popcorn machines, cotton candy machines, snow cone machines, and more. You'll find our low rates and swift deliveries unbeatable! Perfect for relaxed events & get-togethers. We deliver right to your location! Esposito's Ice & Party Rentals is your one stop for planning a great party. We have been specializing in delivering of various kinds of ice for over 30 years, and also offer table rentals, chair rentals and more. Give us a quick contact to see how we can make your summer party worth remembering.